Okay, so you have completed the main campaign of Travis Strikes Again: No More Heroes and now you are looking to try and 100% the rest of the game by finding all the other hidden trinkets and secrets. And what about these hidden characters??? Well don’t you worry as have you covered with our Travis Strikes Again Hidden Characters guide. As you complete each level, you will recieve an added file in the Archives that looks like pages from a video game magazine. 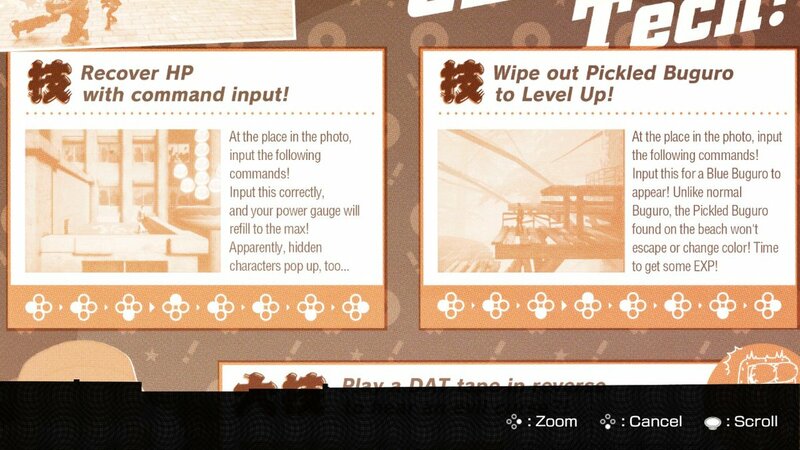 On the right page, it gives some hints and tips to power-ups or hidden enemies along with a cheat code underneath. You have to go to each of these locations, input the code and you will be able to power-up or find a special Bugaro to level up, score coins or gain an extra life. Trying to find some of these places is no easy task but will help you find the location of each hidden character whilst scoring some extra coin and some much welcome EXP. The Cheat Code you have to enter for each location is the same; Y,Y,B,X,Y,Y,B,A or (Left, Left, Down, Up, Left, Left, Down, Right if using the Joy-Con buttons). There doesn’t seem to be a limit to how many times input the code, as long as you leave the game and go back to the location again. There are 10 Hidden Characters in all, and are hidden across 5 games with two in each game. You won’t get anything for finding all of them, not even a T-shirt. You will however, recieve a new fax from K every time you find a hidden character. We have the locations of every single Hidden Character below. Hidden Character #1 – Power Up! Load up from Toilet #001_02 and head towards the factory to the north. In the top right corner of the factory courtyard, input the code Y,Y,B,X,Y,Y,B,A or (Left, Left, Down, Up, Left, Left, Down, Right if using the Joy-Con buttons). You will instantly be powered up and a little 8-Bit character will appear in the lower left corner of the screen. From Toilet #001_04, Go through the Neo Tokyo-esque high street until you spot a Midnite Cowboy sign on the left hand side and a Fireworks sign on the right. Input the code Y,Y,B,X,Y,Y,B,A or (Left, Left, Down, Up, Left, Left, Down, Right if using the Joy-Con buttons). A Yellow Bugaro will appear for you to kill and get some extra coin. Hidden Character #1 – Blue Bugaro, Level Up! Load up from Toilet #002_03 and leave the house to start case 004. Head all the way to the rightand hit the card switch to rotate part of the street. Go up the new path and take the first right on the street and follow it up to the dead end. From here, input the code Y,Y,B,X,Y,Y,B,A or (Left, Left, Down, Up, Left, Left, Down, Right if using the Joy-Con buttons). A Blue Bugaro will appear for you to kill and get some extra EXP. Hidden Character #2 – Recover HP! Load up from Toilet #002_07 and head into the room immediately above from the toilet. Stand in the lower right corner of this room close to the window and input the code Y,Y,B,X,Y,Y,B,A or (Left, Left, Down, Up, Left, Left, Down, Right if using the Joy-Con buttons). You will recover HP and Hidden Character #2 for Life Is Destroy will be yours. Hidden Character #1 – Recover HP! Head up the stairs in the mansion and go left to find Room #202. Head inside and make your way over the many platforms and doughnuts until you reach a roof section that has an arrow of coins pointing downwards to a doughnut. Input the code Y,Y,B,X,Y,Y,B,A or (Left, Left, Down, Up, Left, Left, Down, Right if using the Joy-Con buttons). You will recover HP and Hidden character #1 for Coffee & Doughnuts will appear. Hidden Character #2 – White Bugaro, 1UP! Head to the fourth floor using the left hand side elevators. This time, you will want to go into Room #402. Inside the room, head left from the door and jump over the Doughnut platforms. You will enter a bug battle once on solid ground. fight them off and continue left untile you reach some platforms in the form of large steps. Drop down a step and input the code Y,Y,B,X,Y,Y,B,A or (Left, Left, Down, Up, Left, Left, Down, Right if using the Joy-Con buttons). A White Bugaro will appear. Kill it and you will earn an extra life as well as find hidden character #2 for Coffee & Doughnuts. Go to Cleaning Work and head to the 32nd floor. In the room with the Sheepman Midboss. Input the code Y,Y,B,X,Y,Y,B,A or (Left, Left, Down, Up, Left, Left, Down, Right if using the Joy-Con buttons). You will recover HP and Hidden Character #1 for Golden Dragon GP will appear. You can either take out the Sheepman boss first of afterwards, it doesn’t really matter. Hidden Character #2 – Blue Bugaro! Go to Cleaning Work and head to the 64th floor. In the very last corridor where you get the skill chip you will see a row of two coins together instead of the usual three, (If you already have the skill chip, otherwise the skill chip will be in front of the two coins. Input the code Y,Y,B,X,Y,Y,B,A or (Left, Left, Down, Up, Left, Left, Down, Right if using the Joy-Con buttons). A Blue Bugaro will appear, allowing you to score some extra EXP and Hidden cCharacter #2 for Golden Dragon GP will appear. From Toilet #006_02, head towards the Sheepman pink Midboss. In the same room as the boss, Head towards the lower left-hand side of the room by the dividing wall to the north. Input the code Y,Y,B,X,Y,Y,B,A or (Left, Left, Down, Up, Left, Left, Down, Right if using the Joy-Con buttons). You will recover HP and the Hidden Character #1 for Serious Moonlight will appear. Load Up from the toilet, just before the boss battle with Eight Hearts. Head south until you reach a tunnel on the right hand side of the path. Input the code Y,Y,B,X,Y,Y,B,A or (Left, Left, Down, Up, Left, Left, Down, Right if using the Joy-Con buttons). A White Bugaro will appear. Killing him will net you an extra life and Hidden Character #2 will appear. I think it is a fake secret. I have yet to solve it myself. Great guide, any way you can cover the other collectibles? like Skill chips and UE logos. Thanks for these awesome Travis Strikes Again guides! You’ve been such a huge help!!! You are very welcome. It took me quite a while to find them all and some were not as simple as they look. You are most welcome. It took me hours to find them all but it was worth it to write this guide to help others find the hidden characters quicker and easier.